Hard-Fi are an English indie rock band formed in Staines, Middlesex in 2003. The band's continual members have been Richard Archer (vocals), Kai Stephens (bass guitar), Ross Phillips (guitar) and Steve Kemp (drums). Staines is a suburban location 16 miles (26 km) southwest of Central London that has significantly influenced their musical style and lyrics. Hard-Fi achieved chart success with their third single, "Hard to Beat" and then followed by other successful singles such as "Cash Machine" and "Living for the Weekend", which all reached top 15 in the UK Singles Chart. 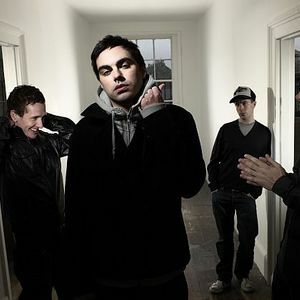 Hard-Fi achieved chart success with their third single, "Hard to Beat" and then followed by other successful singles such as "Cash Machine" and "Living for the Weekend", which all reached top 15 in the UK Singles Chart. Their debut album Stars of CCTV was released on 4 July 2005, and although receiving critical acclaim (NME called it album of the year and was nominated for the Mercury Prize and two BRIT Awards, Best British Group and Best British Rock Act), it didn't reach #1 in the UK albums chart until six months later on 22 January 2006. It originally peaked at number 6. The band's second album, Once Upon a Time in the West, was released on 3 September 2007 and reached number 1 in its first week. They are generally considered part of the indie rock scene, alongside bands such as Franz Ferdinand and have often been compared to a modern version of The Clash. Hard-Fi's latest album, 'Killer Sounds' was released on 22 August 2011, and has produced 3 singles, 'Good for Nothing', 'Fire in the House' and the anthemic 'Bring It On' which also featured in the game Football Manager 2012. The band also recorded the track 'Like a Drug' for the hugely popular Twilight - Breaking Dawn film, and following demands from fans finally released it as a single on iTunes on 16 December 2011.